Antibacterial products have been assessed and approved as safe and effective by regulatory bodies around the world. Product safety is the top priority of the personal care products industry. Companies continuously work to maintain the highest safety standards for all antibacterial products. 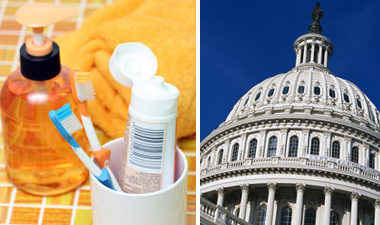 Antibacterial consumer products are regulated by either the U.S. Environment Protection Agency (EPA) or the U.S. Food and Drug Administration (FDA) depending on how they are labeled and intended to be used. Antibacterial products that are intended to prevent disease or illness are regulated as over-the-counter (OTC) drugs by FDA under the Federal Food, Drug, and Cosmetic Act (FFDCA). Antibacterial products that are incorporated into inanimate materials to protect the article itself or provide a public health benefit are regulated by the EPA as antimicrobial pesticides under the Federal Insecticide, Fungicide and Rodenticide Act (FIFRA). Antibacterial handwash products such as soaps and other products for use when water is not available – also known as hand sanitizers and antibacterial wipes — are regulated by the FDA as OTC drugs under the Topical Antimicrobial Drug Products for OTC Human Use; Tentative Final Monograph (TFM) for Health-Care Antiseptic Drug Products (59 Fed. Reg. 31402, June 17, 1994).This regulation is designed to ensure that these products, along with the active ingredients used in these products, are safe and effective for human use. Learn about the details in the FDA’s Federal Food, Drug & Cosmetic Act here. This briefing document on the use of healthcare antiseptic products was presented to the Food and Drug Administration Nonprescription Drugs Advisory Committee (NDAC) meeting by the American Cleaning Institute (ACI) on September 3, 2014. NEW! The American Cleaning Institute (ACI) urged the Food and Drug Administration to re-evaluate all data relevant to the safety and efficacy of antibacterial health care ingredients and make affirmative findings that they are generally recognized as safe and effective. ACI submitted detailed comments October 28, 2015 to FDA concerning the agency’s proposed rules governing over-the-counter antiseptic healthcare products. Read ACI’s full comments here. This document was presented to the Food and Drug Administration (FDA) Nonprescription Drugs Advisory Committee meeting by SDA and CTFA (now American Cleaning Institute and Personal Care Products Council, respectively) on October 20, 2005. This summary describes examples of official regulations, guidelines or recommendations for the use of topical antimicrobial products in general population settings or situations. Antimicrobial pesticide products are categorized as either “public health” or “non-public health,” depending on the specific claims made on each product’s labeling. Registrants of public health antimicrobial pesticide products must submit efficacy data to EPA in order to support their application for registration or amendments to add public health claims, whereas registrants of non-public health antimicrobial pesticide products are required to generate efficacy data but not submit those data, unless EPA requests that the data be submitted on a case-by-case basis. The process of reregistration involves determining the “eligibility” of the active ingredients (a.i.) for all pesticides. These pesticides must be supported with a complete scientific analysis and show that they can be used without causing unreasonable adverse effects to human health or the environment. EPA is responsible for the development and issuance of Reregistration Eligibility Decision Documents (REDs) for all chemicals with mainly antimicrobial uses. The RED document formally presents the Agency’s evaluation of the data supporting the reregistration of a pesticide (i.e. conclusions regarding which uses are eligible for reregistration under specific condition and requirements). Triclosan has been safely and effectively used in consumer products for over 40 years. The US Environmental Protection Agency (EPA) conducted a comprehensive review of triclosan during the development of the Re-registration Eligibility Decision (RED) for Triclosan in September 2008. The RED included an evaluation of all routes of human exposure (both those regulated by the EPA and those regulated by the Food and Drug Administration (FDA)). The FDA regulates the use of Triclosan in medical devices and personal care products such as hand soaps, toothpastes and cosmetics. As part of its Health-Care Antiseptic Drug Products rulemaking, FDA is actively collaborating with EPA, the National Institutes of Health (NIH) and other federal agencies to develop the scientific understanding it needs to determine whether triclosan meets the standard of general recognition of safety and effectiveness. At this time, FDA and other federal agencies agree that there is no credible evidence to demonstrate that triclosan harms human health. FDA has announced that it plans to issue a proposed rule for Consumer Antiseptic Drug Products, which includes antimicrobial soaps and antiseptic hand washes that contain triclosan and are intended for daily use by the public, in the spring of 2011. Triclocarban has been used safely in consumer products for more than 40 years. Existing human and environmental health safety information indicates that TCC is safe and does not present an unreasonable risk to human health or the environment. In the United States, TCC is primarily regulated as an antibacterial ingredient under the Food and Drug Administration’s (FDA) Tentative Final Monograph (TFM) for Topical Antimicrobial Drug Products for Over-the-Counter Human Use: Health-Care Antiseptic Drug Products (59 FR 31402, June 17, 1994). Triclocarban is not a antimicrobial pesticide active ingredient and there are no uses regulated by the U.S. Environmental Protection Agency (EPA) under the Federal Insecticide, Fungicide and Rodenticide Act (FIFRA). The U.S. Environmental Protection Agency evaluated data on Triclocarban as part of their High Production Volume Challenge Program and concluded that triclocarban is safe for its intended use. At this time, FDA and other federal agencies also agree that there is no credible evidence to demonstrate that triclocarban harms human health. The American Cleaning Institute (ACI) is co-leading a coalition with the Personal Care Products Council (the Council) to engage in the U.S. Food and Drug Administration’s (FDA) process to finalize the 1994 Tentative Final Monograph (TFM) for over-the-counter (OTC) Health-care Antiseptic Drug Products. This regulation prescribes requirements for the use of specific active ingredients, efficacy testing, and product label claims for currently marketed healthcare, food handler, and consumer topical antimicrobial products. ACI and the Council actively work with the coalition member organizations to engage the FDA, the industry, and relevant other stakeholders to ensure that the Final Monograph regulation is scientifically appropriate. These efforts are often associated with the submission of relevant technical information to the FDA. The Code, which reinforces existing company practices and introduces some new practices, goes beyond the requirements of the law and highlights the proactive and responsible approach to product safety supported by cosmetic companies. The Personal Care Product Council’s Board of Directors unanimously approved the development of the Consumer Commitment Code to provide consumers, regulators and other interested parties with a clear outline of the specific commitments by cosmetic companies to ensure the continued safety of all cosmetic products. Click here to view questions and answers related to the Code.